We’ll keep you looking great in the years to come. The 3M™ MCS™ Warranty lets you set your worries aside. You can have peace of mind that your brand will look its best for the intended life of the graphics. 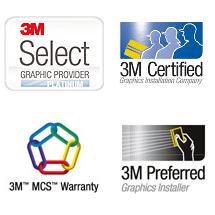 Backed by 3M – the brand you can trust. With Auto Trim DESIGN’s Application Guides, you’ll find key information regarding our graphic solutions for brand managers and business owners. Auto Trim DESIGN Incorporated is committed to operate and integrate environmental, health, and safety (EHS) matters into all business operations.